What we see here is a master at work but also having fun at the same time. Just take note of the cameo. It's like Martin Scorsese is throwing us a little treat, a hint to the fact that even he isn't taking this all too seriously. He's having fun with us, and we better be ready and willing to go along for the psychologically thrilling and exhausting ride. Even when Scorsese is playing with us, he's masterful. No, his latest film, "Shutter Island," is not perfect. But even when not at perfection, Scorsese is a master at the craft and knows how to make a compelling motion picture. His love for filmmaking and for cinema in general is apparent throughout the movie's lengthy running time, quite like Quentin Tarantino's latest work, "Inglourious Basterds." Both present a history that is changed and unreliable, and they both are inspired by endless genres and older works. 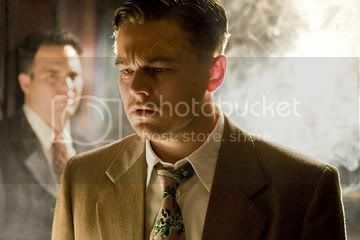 Martin Scorsese knows how to make a film, so let him have his fun, and "Shutter Island" is it. It's dark and delirious, a waking nightmare, and I, for one, loved it. The year is 1954, and U.S. marshal Teddy Daniels (Leonardo DiCaprio) is on his way to the fog-covered, doom-and-gloom-promising Shutter Island with his partner, Chuck Aule (Mark Ruffalo). The island is home to a prison for the criminally insane with a ward that used to be a fort in the Civil War. In other words, there's nothing inviting about this place, and the horrifyingly pounding score at the film's opening confirms this notion without question. The two have been assigned to a case of a missing patient, a woman named Rachel (Emily Mortimer) who is guilty of killing her three children. It appears impossible to leave the island alive as it is surrounded by cliffs of jagged rocks. To the prison's director, Dr. Cawley (Ben Kingsley), it would seem that Rachel just evaporated through the walls. Adapted from a novel by Dennis Lehane, the story is simple enough upon first glance. But the trick is that there's something awfully terrifying about this island. There's something hidden amongst the endlessly heavy walls of gray concrete, and Teddy becomes obsessed with finding out just exactly what it is. The investigation hits a dead-end when the two marshals meet Dr. Naehring (an ever-menacing Max von Sydow) who gives the vibe of being a co-conspirator with Dr. Cawley. Just what could they be hiding in this place? Teddy becomes entrapped by his own involvement and investment to the island as he delves into motives beyond himself. DiCaprio gives a deeply felt and haunting performance as a man torn between his memories and the reality of what is happening to people on the island. Teddy comes across people who could either be ghosts of his past, a trick of the imagination, or mere people who remind him of his own trauma. We receive glimpses into Teddy's history, his involvement in liberating a Nazi camp, along with the life he had with his wife (Michelle Williams) before she died tragically in a fire. They're presented in dreams, hallucinations, and flashbacks, and they're vibrant and beautiful even in their horror. As a hurricane brews with strong winds and sweeping trees, so brews the hurricane inside Teddy's mind. His partner is not nearly as involved, but he cares for his partner. "You OK, boss?" he frequently asks of him. Meanwhile, a visit with a patient named George Noyce (Jackie Earle Haley of "Watchmen" and "Little Children") and an encounter with a different Rachel (Patricia Clarkson of "Lars and the Real Girl") send Teddy deeper into the downward spiral of confusion, frustration, and madness. Every performance here is sublime, no matter how minor the role. The singular scene with Patricia Clarkson is arguably the film's most emotionally potent, and Kingsley never fails to have a glimmer of menace even behind the kindest eyes. This film is all about atmosphere and the tone, that feel of film noir, the pulpy complexity and dramatization of it all. The key is the mystery, following along only with the instinct of your senses, of what you see, hear, and ultimately feel. The movie is an extremely sensory experience, and in the same vein, a surprisingly emotional one, too. It becomes nearly stressful, but only in the best way a movie can transfix and transport you. Scorsese deals with some weighty themes in "Shutter Island," and even here he continues to explore the aspects of human nature that have intrigued him in his other films. The question becomes the clarity of the dividing line between what is considered to be sane or insane and the violence that may come with such. Is it ever justifiable? Nothing is ever what it seems even up to the film's final frame. To speak of the ending would be pointless. Some may like it while others may detest it. For me, I think it works, and it makes sense with the narrative that unfolds. And, best of all, it makes you want to go out and see it again. You have convinced me to go see it. Lots Of Romances For The Price Of One!